Canada is a country in North America consisting of ten provinces and three territories. Located in the northern part of the continent, it extends from the Atlantic to the Pacific and northward into the Arctic Ocean. Covering 9.98 million square kilometres in total, Canada is the world'ssecond-largest country by total area and the fourth-largest country by land area. Its common border with the United States forms the world's longest land border. The land that is now Canada has been inhabited for millennia by variousAboriginal peoples. Beginning in the late 15th century, British and French colonies were established on the region's Atlantic coast. As a consequence ofvarious conflicts, the United Kingdom gained and lost North American territories until left, after the American Revolution, with what mostly comprises Canada today. Pursuant to the British North America Act, on July 1, 1867, three colonies joined to form the autonomous federal Dominion of Canada. This began an accretion of provinces and territories to the new self-governingDominion. In 1931, Britain granted Canada near total independence with theStatute of Westminster 1931 and full sovereignty was attained when theCanada Act 1982 severed the vestiges of legal dependence on the British parliament. Canada is a federal parliamentary democracy and a constitutional monarchy, Queen Elizabeth II being the current head of state. Canada is a member of the Commonwealth of Nations. The country is officially bilingual at the federal level. It is one of the world's most ethnically diverse and multicultural nations, the product of large-scale immigration from many countries, with a population of approximately 35 million as of 2015. Its advanced economy is one of the largest in the world, relying chiefly upon its abundant natural resources and well-developed international trade networks. Canada's long and complex relationship with the United States has had a significant impact on its economy and culture. Canada is a developed country and one of the wealthiest in the world, with the thirteenth highest per capita income globally, and the eighth highestranking in the Human Development Index. It ranks among the highest in international measurements of government transparency, civil liberties, quality of life, economic freedom, and education. It ranks first worldwide in the number of adults having tertiary education, with 51% of Canadian adults having attained at least an undergraduate college or university degree, according to a 2012 OECD survey. Canada is a NATO member, and is furthermore part of several major international and intergovernmental institutions or groupings, including the G8, the Group of Ten, the G20, theNorth American Free Trade Agreement and the Asia-Pacific Economic Cooperation forum. The name Canada comes from the St. Lawrence Iroquoian word kanata, meaning "village" or "settlement". In 1535, indigenous inhabitants of the present-day Quebec City region used the word to direct French explorerJacques Cartier to the village of Stadacona. Cartier later used the wordCanada to refer not only to that particular village, but the entire area subject to Donnacona (the chief at Stadacona); by 1545, European books and maps had begun referring to this region as Canada. In the 17th and early 18th centuries, "Canada" referred to the part of New France that lay along the St. Lawrence River. To punish the resistance of the Thirteen Colonies, Canada's territory was vastly expanded by the British in the 1774 Quebec Act to include unsettled territory in the Great Lakes region down to the Ohio river. Part of this arbitrarily added territory was turned over to the new United States in 1783, but all land north of the Great Lakes (making up much of modern Ontario) was retained by British Canada. In 1791 the British designated this region Upper Canada and the traditional French-speaking portion Lower Canada, they were reunified as the Province of Canada in 1841. A satellite composite image of Canada.Boreal forests prevail on the rocky Canadian Shield, while ice and tundra are prominent in the Arctic. Glaciers are visible in theCanadian Rockies and Coast Mountains. The flat and fertile prairies facilitate agriculture. The Great Lakes feed the St. Lawrence River in the southeast, where lowlands host much of Canada's population. Canada occupies a major northern portion of North America, sharing land borders with the contiguous United States to the south (the longest border between two countries in the world) and the US state of Alaska to the northwest. 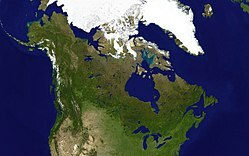 Canada stretches from the Atlantic Ocean in the east to the Pacific Ocean in the west; to the north lies the Arctic Ocean. Greenland is to the northeast, while Saint Pierre and Miquelon is south of Newfoundland. By total area (including its waters), Canada is thesecond-largest country in the world, after Russia. By land area alone, Canada ranks fourth. The country lies between latitudes 41° and 84°N, and longitudes 52° and 141°W. Since the end of the last glacial period, Canada has consisted of eight distinct forest regions, including extensive boreal forest on the Canadian Shield. Canada has around 31,700 large lakes, more than any other country, containing much of the world's fresh water. There are also fresh-water glaciers in the Canadian Rockies and the Coast Mountains. Canada is geologically active, having many earthquakes and potentially active volcanoes, notably Mount Meager, Mount Garibaldi, Mount Cayley, and the Mount Edziza volcanic complex. The volcanic eruption of the Tseax Cone in 1775 was among Canada's worst natural disasters, killing 2,000 Nisga'a people and destroying their village in the Nass River valley of northern British Columbia. The eruption produced a 22.5-kilometre (14.0 mi) lava flow, and, according to Nisga'a legend, blocked the flow of the Nass River.Canada's population density, at 3.3 inhabitants per square kilometre (8.5/sq mi), is among the lowest in the world. The most densely populated part of the country is the Quebec City – Windsor Corridor, situated in Southern Quebec and Southern Ontario along the Great Lakes and the St. Lawrence River.